In a time when drum corps was characterized by rigid formations and military music, Emil Pavlik - nicknamed "Big E" - truly marched to the beat of his own drum. Beginning his relationship with drum corps almost 60 years ago as a bugle instructor with the Racine Y.M.C.A. Kilties, Emil challenged the activity's establishment by expanding the repertoire to include music ranging from original compositions to the jazz of Glen Miller. As a result, the Kilties became a magnet that attracted members from neighboring cities - and from other corps. 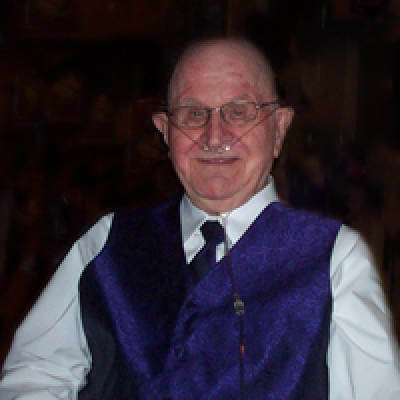 "Emil was the sound of the Kilties for over 20 years," says former Kilties director Edward Porcaro. Members of the era recall a warm atmosphere at rehearsal and Pavlik's commitment to sportsmanship in competition. Emil is especially remembered for leading the Kilties' horn line to great success, despite the fact that the corps' players were often significantly younger than their rivals. "Emil Pavlik is one of drum corps' all time greats," Porcaro says. "He loves his music, he loves the Kilties - but most of all, he loves drum corps." Pavlik passed away on May 15, 2011 at the age of 91.